Provide comfort for the family of George McArthur with a meaningful gesture of sympathy. George Frederick McArthur, 82, passed away on Saturday, April 6th. George was born on October 20, 1936 in New Haven, CT. He enlisted in the Army at 17 and was stationed in Germany from 1953 to 1957as an MP during the Korean conflict. He was an avid ballplayer and upon returning to the United States, was given a tryout with the Brooklyn Dodgers as a pitcher. Deemed too old at 22 by the Dodgers he was offered a full scholarship to pitch for Quinnipiac College. In 1958 George was lucky to meet the love of his life Cathy (nee Bonina). 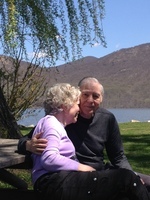 After eloping in Carmel, NY, he and Cathy made a life together that few would have predicted. He graduated from the Connecticut School of Electronics after going to school during the day and working at night to support his growing family. His job with Otis Elevator took him to California and then Louisiana working as a civilian contractor for the Air Force. Although he never completed college, he worked his way up the corporate ladder eventually becoming an International Sales Division Manager for Hughes/General Electric. Although they started with practically nothing, George and Cathy went on to build a beautiful life for themselves while travelling the world. He was blessed with 4 children – his son, Mark and his wife Philomena, who he considered his 4th daughter, of Neshanic Station, NJ, and his daughters Leigh McArthur Giusti and her husband Andrea of Briarcliff Manor, NY, Michele Dunne and her husband John of Tuxedo, NY and Tracey Amenta and her husband, Frank of Fishkill, NY. George lived for his 10 grandchildren. He enjoyed them so completely and fully, it was a joy to see. George was a man who lived life to its fullest, squeezing every last bit out of each day. With a zest and passion for life he always wanted one more ski run, one more lap around the track. He wanted to go just a little faster, longer, higher, and farther. He fought hard and loved deeply. People gravitated to him and he never met a stranger, they were just friends he didn't know yet. He was fearless. He was bold. He was smart in ways that never ceased to amaze. A natural joker and full-time teaser, life with George was always interesting and we will miss him more than our words can express. The family wishes to thank the staff at the NYS Veterans Home in Montrose, NY as well as the staff at Castle Point VAMC for the excellent care and compassion they gave to George. He is also survived by his sisters Mary Lou Knowles and Susan Reynolds and predeceased by his father and mother, George and Martha McArthur and his sister Betty. Donations in his George’s name may be made to VAMC at Castle Point in Wappingers Falls NY or The NY State Veterans Home in Cortland NY. Visitation will be held on Wednesday from 5-8 pm at the McHoul Funeral Home of Fishkill, Inc., 1089 Main Street, Fishkill. A private burial service will take place at Fishkill Rural Cemetery. Please visit George’s Book of Memories at www.mchoulfuneralhome.com. Consider providing a gift of comfort for the family of George McArthur by sending flowers. Dearest Michele and family, So sorry to hear about your father’s passing. Words are never enough in moments like these but please know that my heart goes out to you. Dear Michelle & family, My heart felt deepest sympathy goes to you & your family during this difficult time. May God's love bring you comfort and peace to each of you. May good memories bring you comfort and peace . You and your family will be remembered in my daily prayers. God bless , CHINNU V.ANDREWS, GOOD SAM .HOSPITAL.